Community college faculty members listen to the Board of Regents discuss the system’s budget and consolidation plan on Thursday. A last-minute boost in state funding won’t stave off a looming fiscal crisis for Connecticut’s public colleges and universities, the Board of Regents for Higher Education said Thursday. 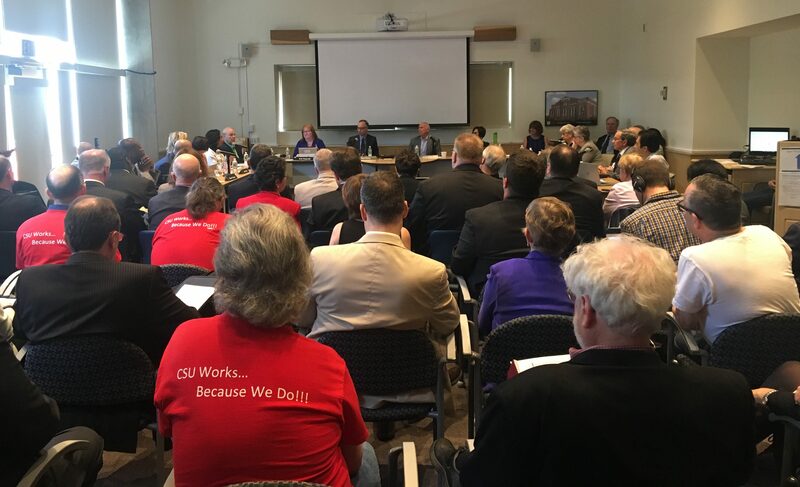 And given that challenge, the panel also reasserted its commitment Thursday to consolidate Connecticut’s 12 community colleges, despite a regional accrediting board’s refusal to endorse the merger in late April. The General Assembly added $16.2 million to help the system cover fringe benefit costs at community colleges in the fiscal year that begins July 1. The system — called the Connecticut State Colleges and Universities (CSCU) — includes the four regional state universities and the online Charter Oak State College as well as the community colleges. The University of Connecticut is separate. CSCU system officials projected tentative deficits of $20 million in next fiscal year’s salary accounts and a $25 million shortfall in the fringe benefits line item. Those projections were made before lawmakers adopted the new state budget Wednesday, and the numbers could be revised again after a full analysis of the budget’s impact on higher education. But Balducci said that $16.2 million boost, though welcomed, cannot reverse a general trend of deteriorating state funding for the college system since the last recession ended nine years ago. Based on a preliminary review of the new state budget, system analysts believe the reserves for Charter Oak State College will be exhausted in the upcoming fiscal year, the community colleges’ fiscal cushion will be gone by the end of 2019-20, and the state universities’ reserves will bottom out in 2020-21. This is crucial, Balducci said, because the regents have drawn down on those reserves on several occasions to avert or mitigate the need for tuition and fee hikes. Tuition last rose in 2016. The regents are expected to adopt a new budget for the upcoming fiscal year in June. President Mark Ojakian answers questions after a Board of Regents meeting Thursday. Fringe benefit costs are particularly troublesome for the system, Balducci said, for several reasons. State contributions for pensions and retirement health care benefits are projected to surge dramatically for the next 15 years or longer as Connecticut compensates for inadequate savings policies dating back to 1939. The fringe rate — the amount Connecticut sets aside for these benefits divided by the number of existing employees — is distorted. That’s because it represents both the cost of saving for today’s workers and catching up on this huge legacy of debt. For the Board of Regents’ system, some fringe benefit costs are covered by funds provided in the state budget. Others have to come from system revenues — which are fueled chiefly by tuition and fees. Connecticut “may be considered wealthy, but we aren’t getting the dollars from the state to support our system,” Balducci said, adding he nonetheless was grateful legislators added funding for the system — on the final day of the regular General Assembly session. Mark Ojakian, the college system’s president, said the Board of Regents still was looking at different possible pathways as it moves to address reductions in state funding and declining enrollment. The New England Association of Schools and Colleges, an accrediting agency known as NEASC, said the regents’ plan to consolidate the community colleges while shedding 200 administrative positions and aligning curricula for more than 200 degree programs was too great an undertaking to do so quickly with such a reduced staff. The board is still considering a modified version of the plan, which is meant to save a projected $28 million. The officials will have to inform NEASC of their plan by the end of July. “We can agree or disagree on what path forward that we should take, but I don’t think there should be any conversation about the fact that we don’t face a serious financial issue in the future,” Ojakian said. 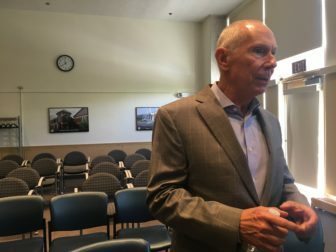 Ojakian said the board remains committed to preserving campus locations, holding down tuition costs, and giving students a high-quality affordable education. Faculty who fervently oppose the merger took turns at the meeting objecting to the plan, calling it unrealistic and formulated despite a lack of consultation with key stakeholders. Central Connecticut State University professor Dr. Matthew Ciscel said the board failed on many levels, including securing adequate funding to enhance the college system. “You have failed and you continue to fail to put students first because you have failed to listen to both the vast majority of students and those who serve the students,” Ciscel said. Hector Navarro, the Student Advisory Committee chair, said the group will continue to strongly support Ojakian as long as he keeps campuses open and doesn’t raise tuition. “But once the tuitions start to rise and we start to need campuses closing, it’s just, enrollment rates are going to go down and we can’t continue our education in that position,” Navarro said.